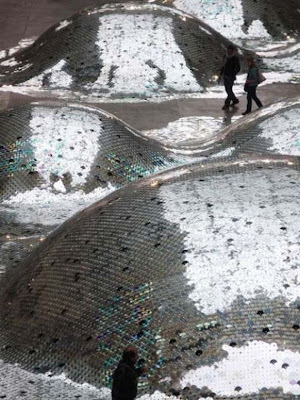 Silver dunes made up of 65, 000 CDs lay shimmering on the grounds of the Halle d'Auber villiers in the Centquatre in Paris. 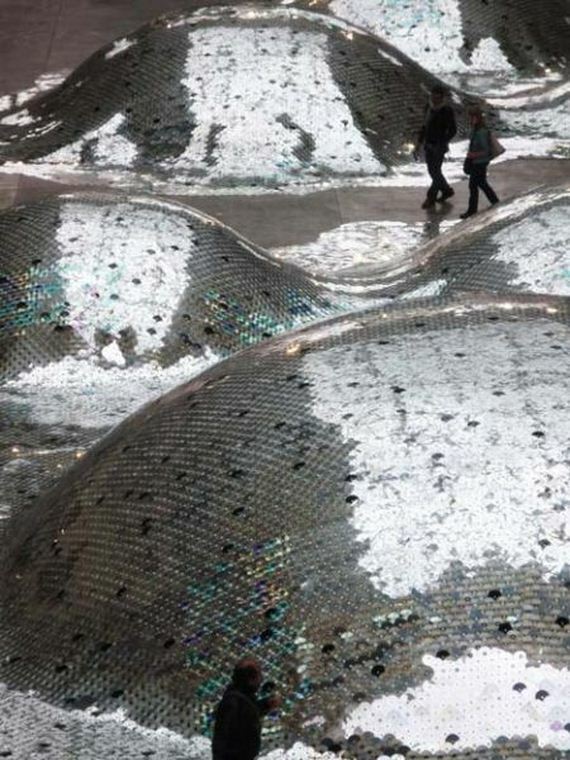 Covering about 500 square feet of sorted and hand-sewn CDs, this impressive display of an alien-like-overlay is installed by artist Elise Morin and architect Clémence Eliard in collaboration with 104, entitled the WasteLandscape. It's a commentary on how our wasteful and toxic habits of using plastics and other non-recyclables do not simply disappear once they're out of sight. WASTE LANDSCAPE - Centquatre 104 - 21-07 // 11-09-2011 from Elise Morin. WasteLanscape will be on display at the Halle d'Auber villiers until September 11th; thereafter it will be travelling to a new location—continuing its mission to spread more conscious awareness to resolve our detrimental environmental issues—by employing our waste to form an art traveling landscape. To learn more on where our non-recyclable waste end up, check out Carlo Ratti's (from SENSEAble City Lab, MIT) recent talk at TED on his waste sensor project at MIT. Carlo Ratti (MIT): Architecture that senses and responds.